At the forefront of the UK industry for more than forty years, Saville Audio Visual specialises in the sales, hire and installation of AV equipment and integrated systems, including projectors, screens, videoconferencing and digital signage networks. 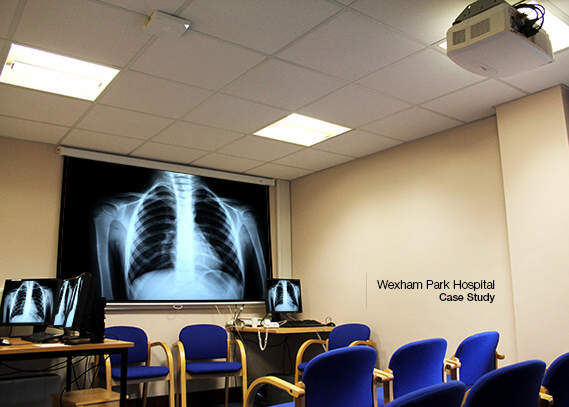 Задача: Wexham Park Hospital needed a replacement projector to present images from its Picture Archiving and Communication System (PACS) to a multi-disciplinary team. Решение: They installed the bright, high resolution Optoma EH505 projector which includes the special medical DICOM simulation mode. Результаты: The EH505 has helped the multi-disciplinary team to view clear, bright images from its PACS enabling them to discuss cases together. 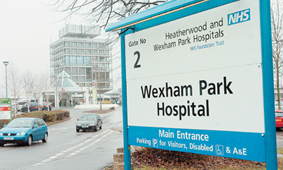 Wexham Park Hospital near Slough provides acute services that include cardiology, maternity, stroke and emergency, with more than 100,000 A&E attendances every year. PACS is a medical imaging technology which provides economical storage of, and access to, images from multiple modalities. Electronic images and reports are transmitted digitally via PACS; eliminating the need to manually file, retrieve, or transport film jackets. The universal format for PACS image storage and transfer is DICOM (Digital Imaging and Communications in Medicine). The hospital needed a replacement projector for its fairly bright, multi-disciplinary team room where specialists from a range of disciplines, such as pathology, oncology and radiology, meet to discuss patient cases. It needed to present the images from the PACS to the whole multi-disciplinary team so that all staff can see and discuss the cases together. The projector needed to be cost-effective and high resolution with flexible lens options to ensure flexibility in installation. Saville Audio Visual recommended and installed the Optoma EH505 in August 2013. This 5,000-lumen projector with WUXGA resolution and powerful image blending tools delivers spectacular image quality and outstanding brightness. The EH505 includes a special DICOM simulation mode that has been specifically tuned for viewing greyscale images, X-rays and scans. The zoom, lens shift and interchangeable lenses ensured that installation was straightforward, enabling the hospital to use the existing ceiling fixings. The EH505 provides much clearer, brighter images than the hospital’s previous projector. It presents the images being viewed on the monitor to the whole multi-disciplinary team using a big screen which enables them to discuss cases together. Optoma ProScene EH505 projector with standard lens.